Ever try out a project, expecting one thing and then getting something completely different? That’s what happened with a recent art adventure. I loved this stained glass art with toilet paper rolls and never had a chance to try it out. It seemed so easy. Stamp, wait, then paint! Boom. 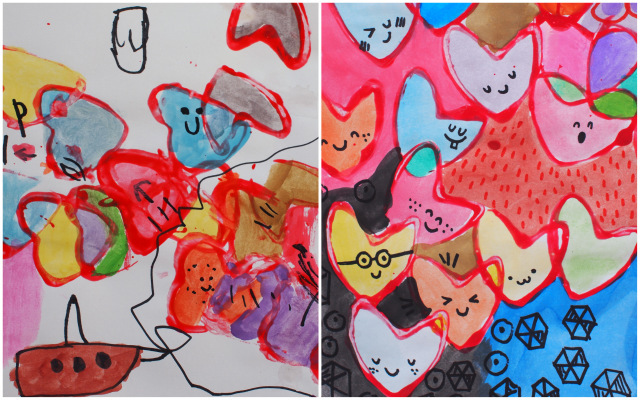 Easy and colorful kid art! 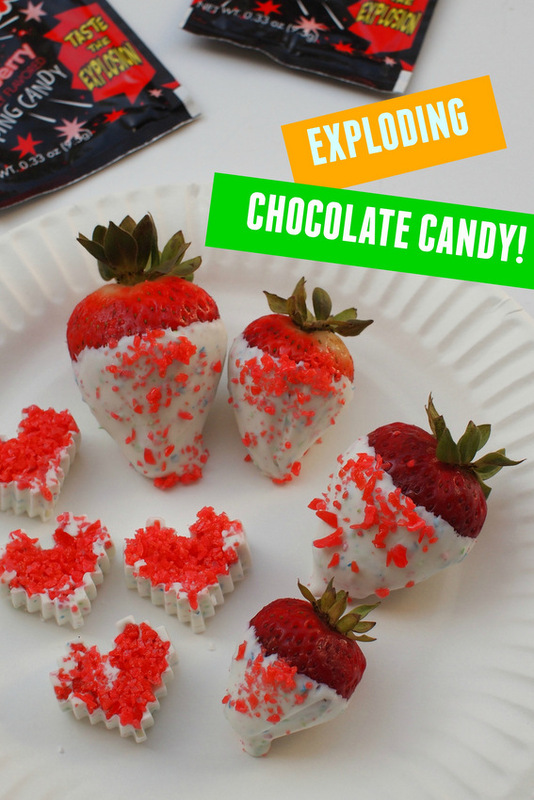 Well, my preschooler and I've started making Valentine's Day Crafts and made a Valentine’s day version….with unexpected results! Make Pasta Frames with Kids! Ah, pasta. It's cheap, always in your cupboards, yummy...and a GREAT crafting material! 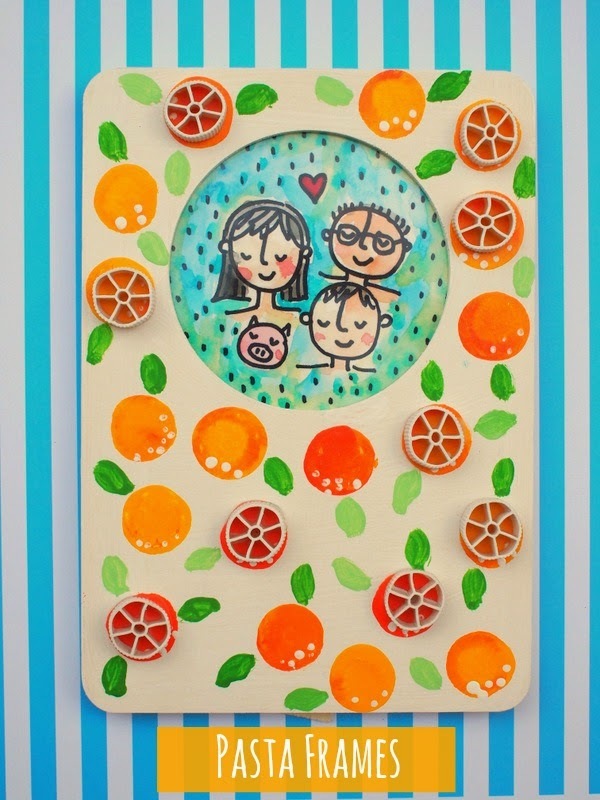 Today I'm super excited because my fellow Rockin' Art Moms and I came up with 14 super fun, beautiful, and easy pasta art projects that you can make with your kids! And... *drum roll please* we want to see YOUR pasta creations and we're also hosting a GIVEAWAY too. Yippee! So definitely check out the bottom of the post to see the giveaway details and all the other ladies' awesome posts. Chuck and I decided to use our pasta to decorate painted picture frames! Note: This is a sponsored post. All opinions are my own. Recently Plaid Crafts sent samples of craft paint and Mod Podge to a couple of craft bloggers. They challenged us to create funky, fun, and unique Valentine Card Boxes. Paint? Mod Podge? Fun Card Boxes? Oh yeah. You can bet that I was all over this challenge to celebrate Valentine's Day with Plaid Crafts! Before I forget, Plaid Craft is offering a special coupon promo code. If you use the discount code LOVE2015, you'll receive $10 off orders over $35, plus free shipping*. You can save on tons of Plaid brands like Apple Barrel, Mod Podge, Martha Stewart Crafts, and more. The code is valid through 3/31/2015 and can only be used once. Just visit their site for more details! *Free shipping is not available in areas where ground shipping is not offered. Often times I just wanna make something, cute, kiddy, and fun. 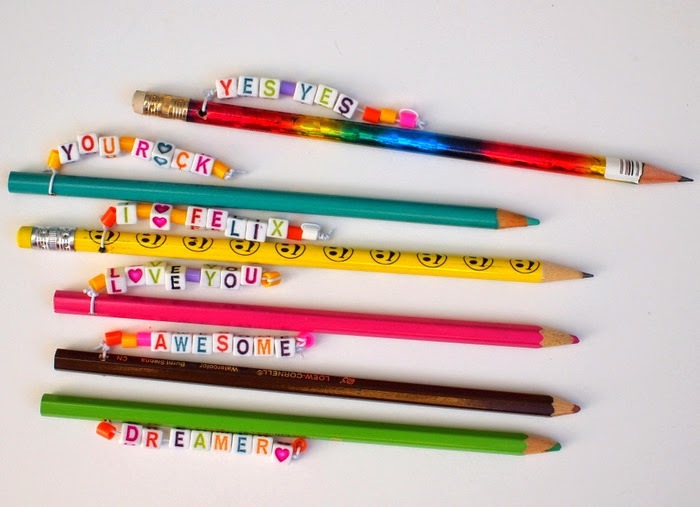 And that's totally the vibe that I was feeling when I made these personalized pencil toppers. *Insert girlish squeal* Colorful perler beads? Lovely letters? Hearts? Too. Much. Cuteness. So satisfy your inner elementary school girl and stop on by DIY Candy to see how I made these bad boys. 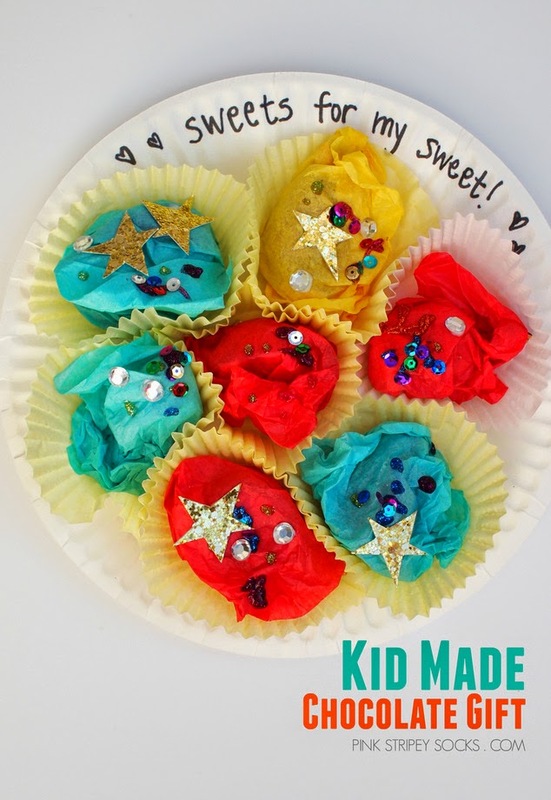 And if you feel like making more super cute and fun kids crafts, check out the links below! 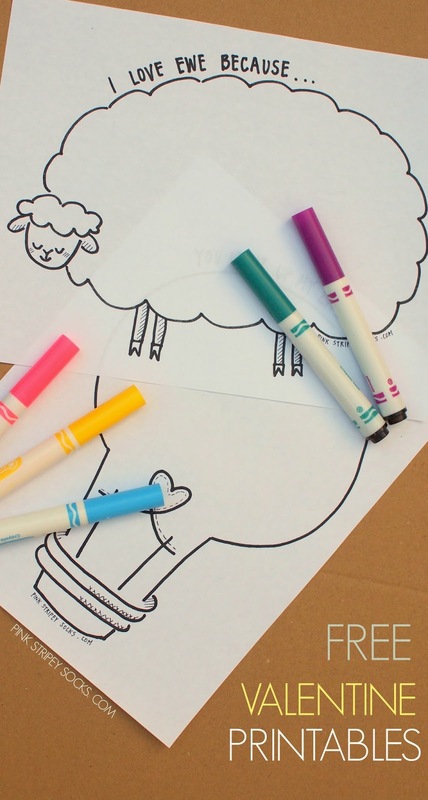 5 Super Cute and Fun Kids Crafts! Sometimes I wish I could be a kid again just to experience the magic of different holidays. Do you ever feel that way? As a child New Years seemed cooler, Christmas seemed more magical, and Valentine's Day was way more romantic. Now that Chuck's getting older, I see him getting excited about holidays too.... and I LOVE it. Here's a fun Valentine Card Box that I recently designed with Chuck in mind. (He loooooves sharks.) Isn't it hilarious that the shark "eats" the Valentines? 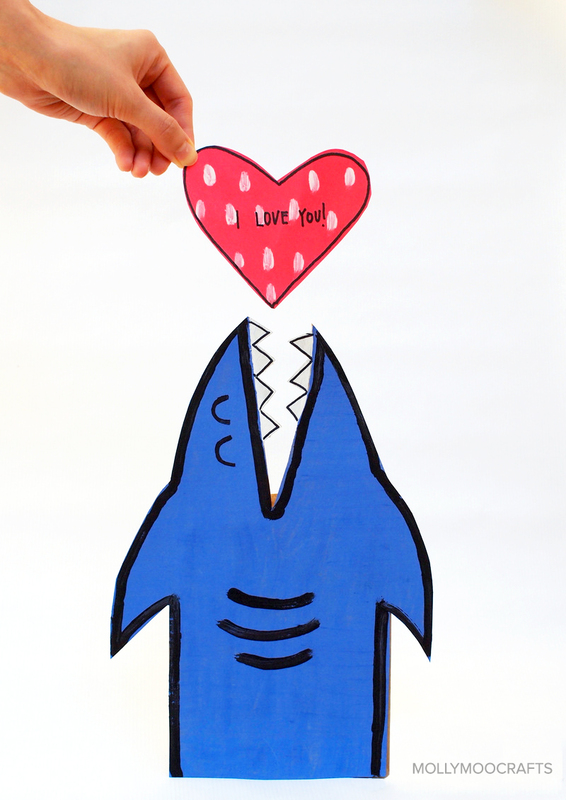 You can find out how I made this Shark Valentine Card Box at MollyMooo Crafts! 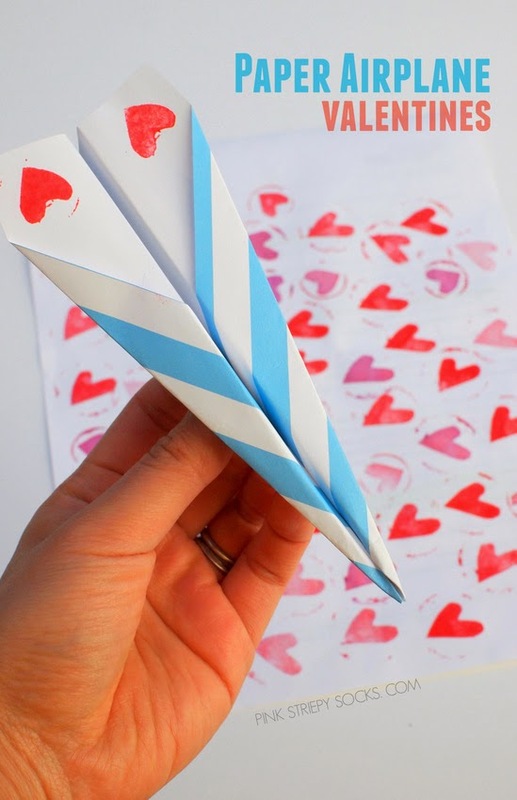 And if you're looking for 3 other cute Valentines day crafts, check out the links below! Today I'm continuing the funny Valentine Day Series with these 2 free Valentine Printables! 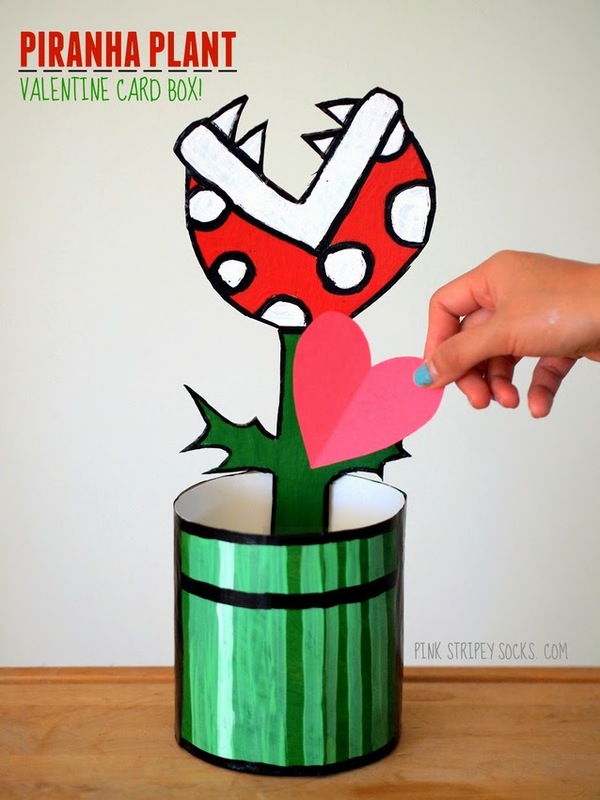 To see the other funny Valentine's day crafts in this series, check out the links below! #3- Send "High Fives" To your Valentine! Funny Valentine's Day activity #4: 2 FREE Valentine Printables! Love reading with your child? Love Valentine's day too? Well then you're in luck! Today is Read and Play Day! 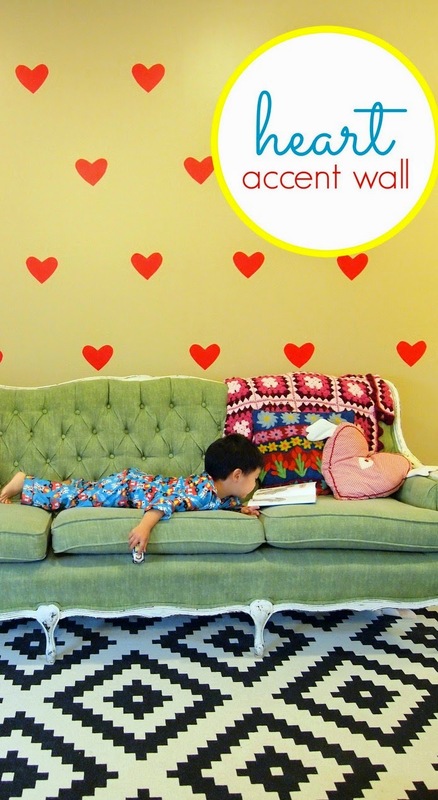 Today, several kid bloggers and I are sharing 27 great Valentine's books and corresponding activities and crafts on our blogs! You can check out The Pleasantest Thing for the full list of all the great activities! 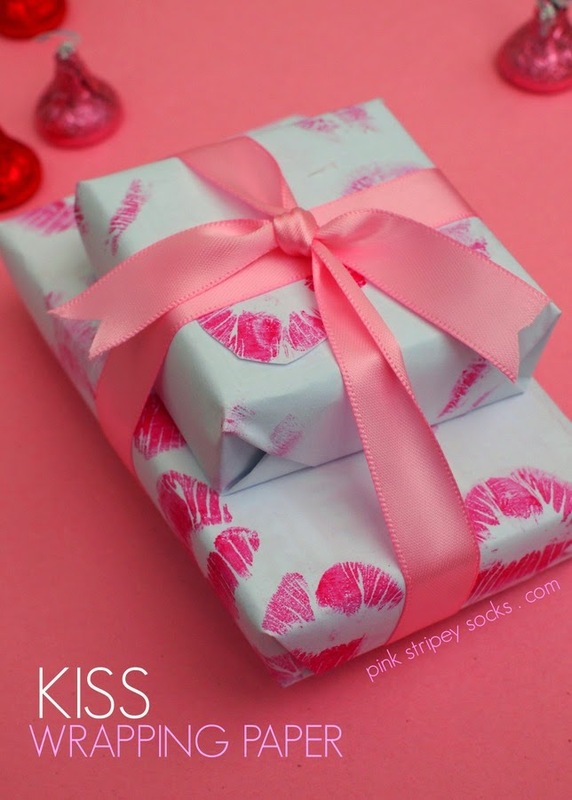 Here's the Valentine's Day craft that I made with Chuck- DIY Kiss Wrapping Paper! Send High Fives to your Valentine! Are you looking for a unique and simple idea for a Valentine's day card? Or, are you looking for a quick way to send someone some encouragement? How about sending them some high fives? 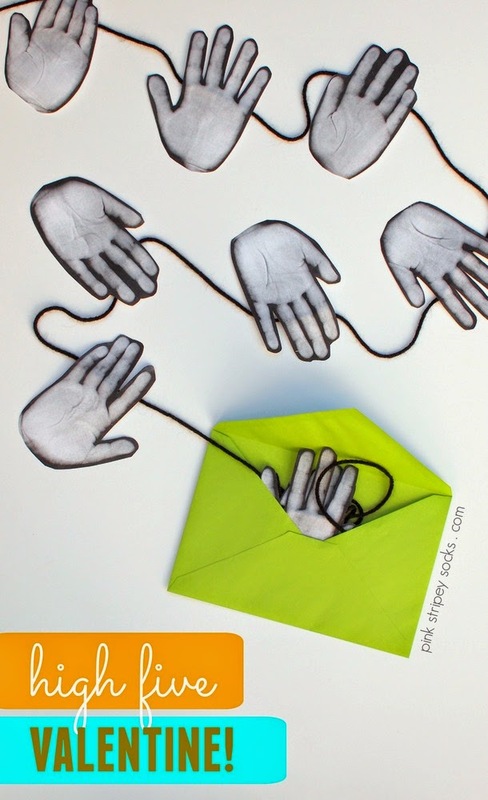 Funny Valentine's Day Craft 3: Send someone high fives! Lately Chuck hasn't really wanted to do any crafting. But I loooove making things, so I've been trying hard to figure out other ways we can craft together. I've noticed that while he may not like painting or drawing, he does seem to like using technology. Light bulb moment! So instead of usign paint or plaster of paris to make traditional hand print crafts, we used technology! Last week I shared about our new fascination with butterflies. 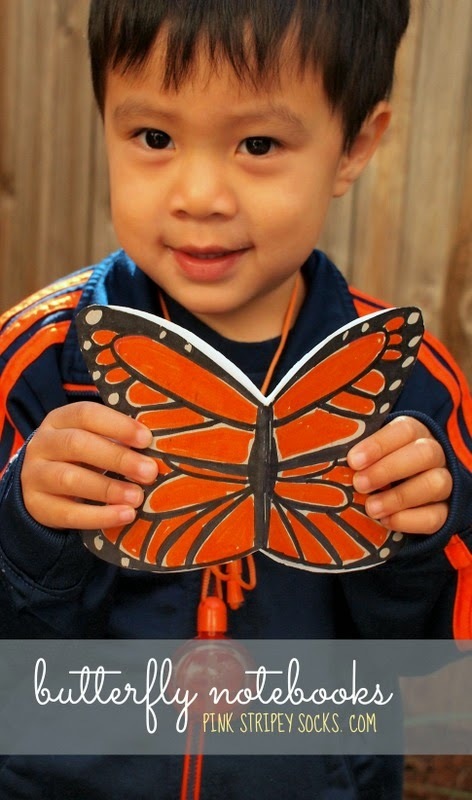 (You can read about it and see our fluttering butterfly kid craft here.) My mind was still on butterflies when I came up with this idea for a DIY butterfly notebook. Funny Pun-y Valentine's Day Craft 2: "You set my Heart aflutter" Butterfly Notebooks! 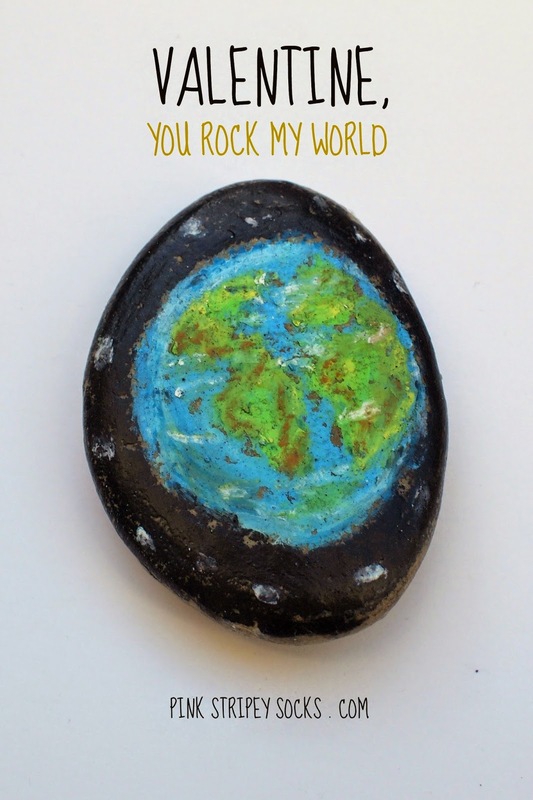 You can see my first funny, pun-y craft here (Craft 1: "You Rock My World" Rocks). Valentine, You ROCK MY WORLD! Even though our Christmas tree is still up (I know, I know, I haven't the heart to take it down), my mind is currently on Valentine's Day and all the lovely crafts that go along with that. Last year we made adorable heart shaped glasses and DIY Coffee and Candy Gifts. This year I'm challenging myself to think of 10 easy funny, pun-y crafts that say Happy Valentine's Day! I love crafting and making things with Chuck. But sometimes, I also like to sneak away and paint things by myself. So at night while he sleeps, I pull out random things and paint them. Today's post is about one of those nights... and one of those secret painting sessions. You see, I originally purchased 2 frames for Chuck to paint as gifts... (like he painted this frame here). But then I couldn't resist their siren call and ended up painting them myself. The designs were inspired by my love for colorful Mexican blankets and this super easy DIY Agate Watercolor Artwork. Hrmm.. magazine strip silhouette art? 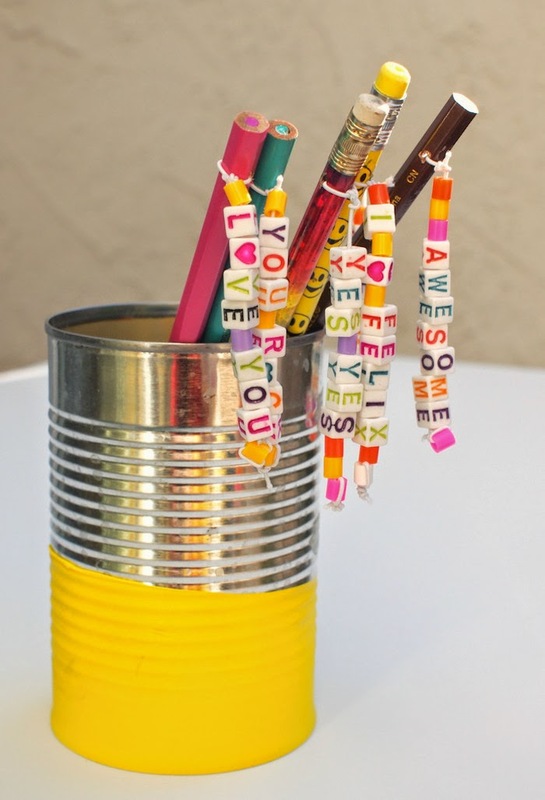 Sounds kind of naughty, but I promise you this recycled craft is anything but that. Take a look! See? Totally PG and totally cute. I'm always on the lookout for easy and affordable DIY artwork. This silhouette heart looks great and BONUS uses recycled materials. Keep reading to see how I made it! Sprinkles are the happiest decorations in the world. They're super colorful and remind me of sweets and cake. So I made these sprinkle cake toppers to turn boring rice krispies into something a bit more festive and Valentines-y for our toddler group. They were super easy to make and added a happy touch to my snacks. Keep reading to make them for yourself!